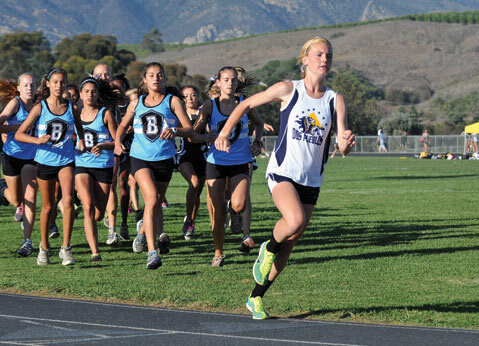 <b>LONG-DISTANCE LEADER:</b> “I like cross-country more because I like the longer distances and the scenery,” said Dos Pueblos runner Addi Zerrenner. Zerrenner, pictured at the front of the pack, has won every race in her cross-country career on the DP course. Bill Cosby recorded an album about sports in the late ’60s. You could tell the time frame by the content. Sports were something that guys did — Cosby played football and basketball and ran track — and girls watched. It was the start of a sensational running career. Zerrenner holds the Santa Barbara County records for the 1,600- and 3,200-meter runs on the track. In the fall, she has thrived in cross-country, where the terrain and the elements are more challenging. “I like cross-country more because I like the longer distances and the scenery,” Zerrenner said. She never lost a race on the three-mile Dos Pueblos course, and against the top runners in Southern California, she competed progressively better in the CIF Southern Section finals — fifth place in 2011, third in 2012, and second in 2013. Len Miller was the first coach to recognize Zerrenner’s potential. He was coaching the DP boys team, which has produced such outstanding runners as Sergey Sushchikh (now competing at UCLA) and Bryan Fernandez (Oregon). “She has the heart of a Kentucky Derby thoroughbred,” said Miller, who trained Zerrenner with the boys. Purnell took over from him this year and continues to coach Zerrenner, while Leslie Roth coaches the rest of the Chargers girls. As for the race at the Portland Meadows, if it had a title, it would be “Frozen.” The wind chill was 18 degrees, Zerrenner said — not very auspicious for a girl who was given the nickname “Shivers” in grade school. “Everybody knows I’m always freezing,” she said. She wore her usual tank top and shorts at the starting line. “I went into cold shock,” she said. “I really don’t remember the race. I thought I was doing okay. Nobody was passing me. I was disoriented after finishing.” She had symptoms of hypothermia and was rushed back to the athletes’ hotel. “I took a warm shower and slept,” she said. She had finished 109th out of 198 runners. “It was disappointing to be back there,” Zerrenner said. “Weather permitting, I believe I could have been in the top 10.” Baxter, the two-time defending champion, finished third behind runners from Washington and Colorado — the only setback of the California star’s career. Zerrenner said she’ll be better prepared for freezing weather in the future, especially if she goes to college in the north or east. One thing’s for sure: Her sport does take a lot of guts, and she has them. <b>STAYING THE COURSE:</b> High school cross-country runners from San Marcos, Dos Pueblos, and Santa Barbara explore the terrain of Elings Park, where a “fund-racer” running festival will take place Saturday, December 14. ELINGS TERRAIN FESTIVAL: Community runners can see if they have what it takes to compete on natural terrain Saturday, December 14, at Elings Park. There will be an open 5K run, a 3K kids run, and a 3K dog run. The festival will benefit the cross-country programs at Dos Pueblos, San Marcos, and Santa Barbara high schools. Athletes from the schools will participate and volunteer at the event. And yes, girls can watch, if they aren’t running. Paul Bradford, in the last of his many years as a parent of a prep cross-country runner, is the organizer of the event, which will include a post-race party. To register online, visit elingsterrain.com. On-site registration begins at 8:45 a.m.; the running starts at 10 a.m.
FLEET FEET: It was a good season for several area cross-country runners. The boys team from Dos Pueblos took second in the CIF-SS meet and third in the state (Division 2). The Chargers were led by senior Cole Smith, who improved from sixth place in the section to fifth in the state. San Marcos qualified its boys team for the state meet for the first time. The Royals, led by Ryan Sorensen in 23rd place, took 10th in Division 3. Adilene Aldapa, a San Marcos junior, qualified individually and finished 20th in the girls race. In the state community-college championships, SBCC’s Ian Roberts placed seventh. Roberts, a sophomore, was Western State Conference champion. UCSB took a second (men) and third (women) in the Big West team championships at Cal Poly. Westmont College’s women took 18th in the NAIA Championships in Lawrence, Kansas. <b>RUNNING CHILDREN:</b> The kids were garbed like Santa but moved like reindeer in the Santa Claus 5K & Mile Fun Run last Sunday at La Cumbre Plaza. The event was a benefi t for Kidz for a Cure, a children’s cancer charity. 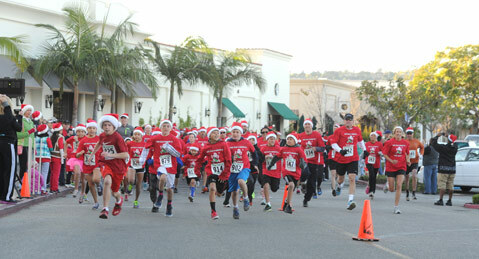 HO, HO, HUFF, PUFF: There was a stampede of Santas, with a few elves among them, at La Cumbre Plaza last Sunday morning. It was the Santa Claus 5K & Mile Fun Run, a benefit for Kidz for a Cure, a children’s cancer charity. … Another chance to run in the spirit of the season will take place Saturday afternoon, December 21, when the Santa Barbara Running Co. presents the Ugly Holiday Sweater Run at 110 Anacapa Street. Prizes will be awarded to those who wear the most disgusting sweaters. Visit sbrunningco.com.